IMPERIAL, CA – Dave Miller said, “This ski is UNBELIEVABLE! Another 39! I have not missed one yet!”. “I rode the 65 inch Goode MID-RIDE today and I was impressed with the width and angle I was able to obtain. After testing some different binding and fin settings I ran 39 off the dock. The next sets I ran 39 again and again, ” Miller continued. 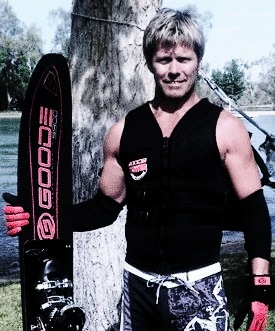 “The new Goode MID-RIDE works awesome and I believe this is the ultimate 34 mph ski,” Dave Miller concludes. The 9900SL “MID-RIDE” (MID) from Goode is new for 2010. Dimensionally, the MID fits right between the WIDE-RIDE and the standard 9900SL. The MID creates fluid starts to each turn, like the standard 9900SL, and finishes each turn “clean”, like the WIDE-RIDE. The MID is a great choice for skiers who are undecided between the WIDE-RIDE and standard 9900SL. The MID was first tested in the fall of 2009 at the Ski Ranch six-round Record Tournament in Covington, LA , by 2009 World Cup Slalom Champion Nick Parsons. After skiing only 3 sets on the MID, Nick ran his Personal Best (3 buoys @ 41’off/10.25m) three of the six rounds! The 9900SL MID incorporates Goode’s SL asymmetric features. There are two models of skis in each length and flex, each designed for a specific skier, Right-Foot Forward or Left-Foot Forward. The 9900SL MID is made with premium grade PURE Carbon Fiber construction. Each 9900SL MID ski compensates for the flex and torsional differences introduced by different skiing styles and virtually removes the idea of an “Off-Side” turn.